Women typically notice hair loss during the menopausal period with reduced hair density usually in the middle of the scalp that thins laterally. 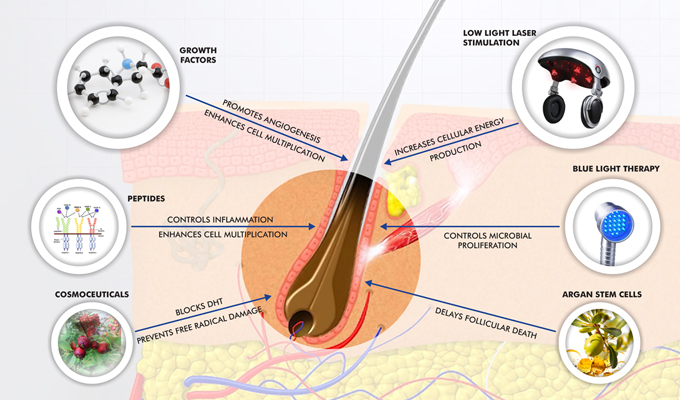 The hair is often miniaturized because of a longer resting telogen phase. Rarely hair loss occurs in the frontal hairline. Hair grafting, also called hair transplant surgery, is an outpatient surgical procedure performed in a hair surgeon’s office. Gone are the days when a hair transplant made a scalp look like a field of newly planted corn. 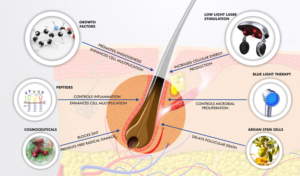 New technology and improved surgical techniques are transforming the hair transplant industry. DR DONALD Ng, who runs Alaxis Medical and Aesthetic Surgery, has worked and trained with prominent doctors in Singapore, Thailand, South Korea, Japan and the United States. 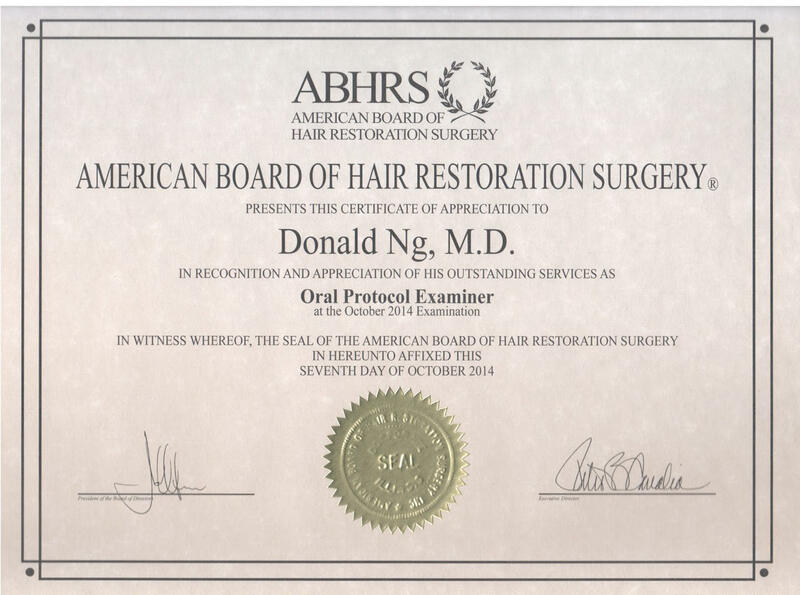 Is also a registered with ABHRS The American Board of Hair Restoration Surgery. 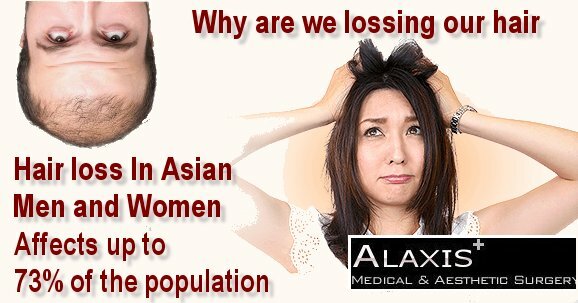 At Alaxis Medical and Aesthetic Surgery, in Singapore we recognize women suffering with hair loss require a different approach than men when considering hair and eyebrow restoration. 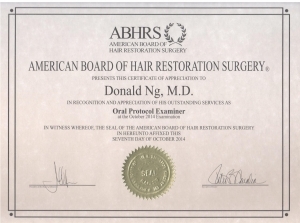 DR DONALD Ng is one of a few board certified doctors that is deeply involved in hair loss for women in Asia. For id patients who suffer from hair loss, the most important decision for you is to have a proper diagnosis and appraisal from a specialist of hair disorders. After the correct diagnosis is made, about 10% of patients elect to go on for surgical hair transplantation. There are basically two types of surgical procedures available for women who want desire thicker hair or fuller eyebrows. For those women who are eligible to have surgery, the harvesting procedures available are the Strip method and Follicular Unit Extraction (FUE). For female hair line – it is becoming popular to do hair transplants to fill up the corners of the female hairline as well as bring down the hairline by 1-1.5 cm to make the forehead less protruding / bony and more cute looking. This is especially popular in Korea for some years now. This can be achieved by harvesting hair from the back and re-planting them in the front, we will follow the current direction of the hair to make it look natural. The harvest area can usually be covered by hair as most women fashion long or shoulder length hair, so after operation you can go back to normalcy almost immediately. After 2-4 weeks, new hair grows and the harvest area looks like before. 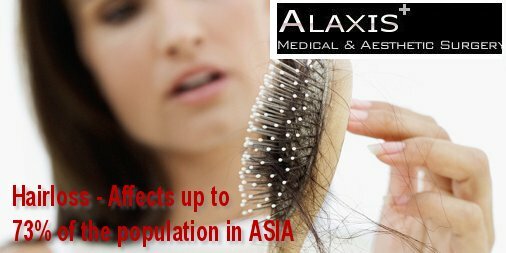 Areas of hair loss we can treat at Alaxia Aesthetics of Singapore. Local hair loss occurs from scaring and non-scaring diagnoses. Alopecia Areata is a genetic condition and is the most common non-scaring etiology of hair loss. Scaring hair loss is seen in Lupus, Lichen Planus, or local radiation. Baldness from injuries, or from local medical problems that have been cured, are usually amenable to hair transplantation. Some women have a hair loss pattern similar to men. Women with male pattern loss typically have thinning in the frontal hairline and the top of the scalp, while the sides of the scalp remain relatively spared. Women with this hair loss pattern make excellent candidates for surgical restoration. Diffuse thinning of the scalp is the most common form of female hair loss. Diffuse thinning involves a reduction in the diameter and thickness of the hair shaft. The medical term for this type of thinning is “Diffuse Un-patterned Alopecia”. These women have thinning that involves the donor area so that women with this type of hair loss are generally not good candidates for surgery. For more information on this or anyother treatments. Please complete the form below.